If I name the city Pisa, you will probably think about the Leaning Tower of Pisa and all the funny photos everybody takes below it trying to make it not fall down! 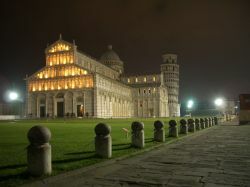 But besides this fantastic monument and the famous Piazza dei Miracoli, Pisa is also well known, at least among the Italians, for being one of the best University cities and offering to its students a really amazing night life!! I have a few friends studying there and every time I can, I go there for the weekend! The city is really pretty and quite easy to get around by bike or foot with two nice bridges linking the two parts of the city together. Want to experience the ‘real’ Italy? It’s a Pisa cake! Do you want to experience a real slice of contemporary Italian life? Do you want to party like a Pisano, take time out like a Tuscan, and lounge along the river Arno like a local? 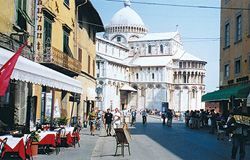 If so, Pisa is THE place to visit! I had an utterly awesome time in Pisa. I really recommend it to anyone wanting to spend time in a beautiful Italian city, but yearning to get beyond feeling like just one of a zillion swarming tourists! There is no question that the city is gorgeous, historic, and has one of the most famous and instantly recognizable landmarks in the entire world (the mighty Leaning Tower of Pisa of course! 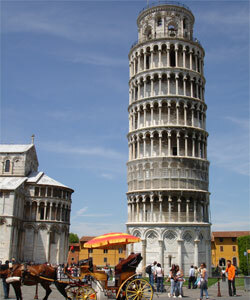 ), but Pisa is also nicely compacted. Pisa – a leaning tower… so what?